Mattresses can be rather expensive to replace and because of that too many of us hold on to them for far too long. By not replacing a worn mattress you sacrifice a good night’s sleep that can leave you tired, stiff and often in pain. Eight hours of sleep per night over 8-10 years is 23,360-29,200 hours of use. Consider what would happen to a chair if it was put through that type of use! Here are some tips to help you determine whether or not you should consider replacing your mattress. The first thing to consider is the age of the mattress and foundation. The mattress industry recommends replacing them every 8-10 years regardless of the condition of the mattress itself. The reasons for this is because over time mattresses become filled with allergens and dust mites that can lead to health issues and poor sleeping conditions. If you don’t use a mattress often, possibly because it’s in a guest room, then you can consider going longer than 10 years. Even if a mattress is less than 8 years old it can stop offering the needed support for a good night’s rest. You should remove all linens from the mattress and give it a good look over. Inspect the mattress for damage like rips, sagging, drooping, bunching and protruding springs. Sagging and drooping mean the mattress has lost its ability to support you so your sleep will suffer and you may have pain when you wake in the morning. 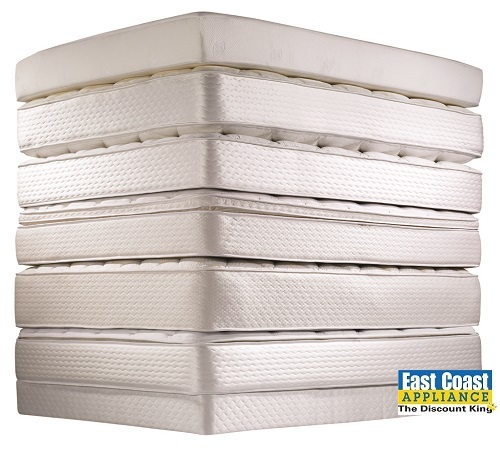 Bunching usually happens only with pillow top mattresses and will create a pile of the pillow material in one area. This is uncomfortable to sleep against and will cause you to move around to avoid that area. Protruding spring can be a hazard as they can cut or scratch you. If any of these are present in your current mattress you should consider replacing it. Another consideration is how comfortable you are on the mattress. If you find yourself moving around trying to get comfortable, if your arms or legs fall asleep while you’re lying on it, then you should also consider replacing your mattress. Something many couples don’t consider when they come together is the size of the mattress. Many new couples will use a bed from one partner or the other, but a full size bed is probably not large enough for two adults to sleep comfortably on. Another factor for couples to consider is weight gain and loss. If one, or both, of you have put on or taken off a lot of weight the bed may not be right for you anymore. This can make it very difficult to get a good night’s sleep. The last, but most important, factor to consider is your quality of sleep. Your mattress may look great, no rips, no sagging, and no protruding springs, but if you aren’t sleeping well then it’s time to go mattress shopping. The technology that’s goes into creating mattresses today is light-years ahead of just 10 years ago so you should give yourself plenty of time to educate yourself before shopping for a new mattress and then plan enough shopping time so you’re not rushed and can evaluate the different styles by actually laying on the mattresses for 15-20 minutes each. The fact is, we spend too many hours on our mattresses to skimp on a good night’s sleep. This entry was posted in East Coast Appliance and tagged chesapeake, East Coast Appliance, hrva, icomfort, mattresses, newport news, rva, serta, shopping, simmons, tempur-pedic, va beach. Bookmark the permalink.